It’s no secret that Virginia is good apple country. 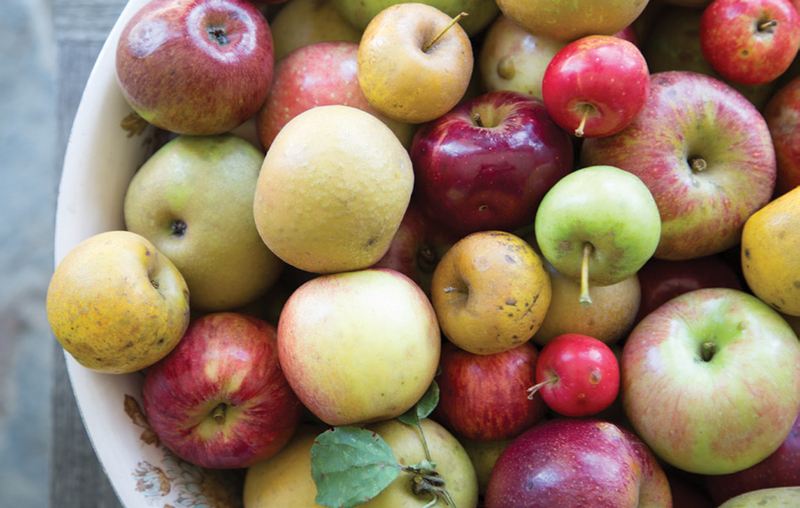 Every autumn, farmers markets burst with bins full of apples from local orchards. Seasonal recipes abound with apple ingredients, the perfect complement to mellow golden days and crisp evenings. It’s the time of year when everything apple sounds inviting, including hard apple cider! And if you can get locally-sourced cider, so much the better. Virginia cideries are on the rise, and while the refreshing beverage they produce has a long tradition in the colonies, today’s hard cider is all about moving forward. In Britain, the world’s top producer of the drink, the term “cider” refers to the alcoholic beverage. Here in the States, “cider” often refers to unfiltered apple juice, so we use “hard cider” to distinguish the grown-up version, which, like wine, is a fermented drink. You’ve probably heard of hard ciders such as Angry Orchard, Woodchuck, and Virginia’s own Bold Rock. This style of hard cider is packaged in long neck bottles and marketed as a craft beer alternative. Like beer, water is added, giving it an alcohol content of around 5 percent. While it is tasty, popular and commercially successful, there is another style of hard cider that is garnering attention. Virginia cideries such as Foggy Ridge Cider, Albemarle CiderWorks and Castle Hill Cider make an artisanal drink that can be enjoyed much like wine, both by itself and with food. This type of hard cider comes in a wine bottle and, though there are many different styles, often has an effervescent freshness similar to sparkling wine. 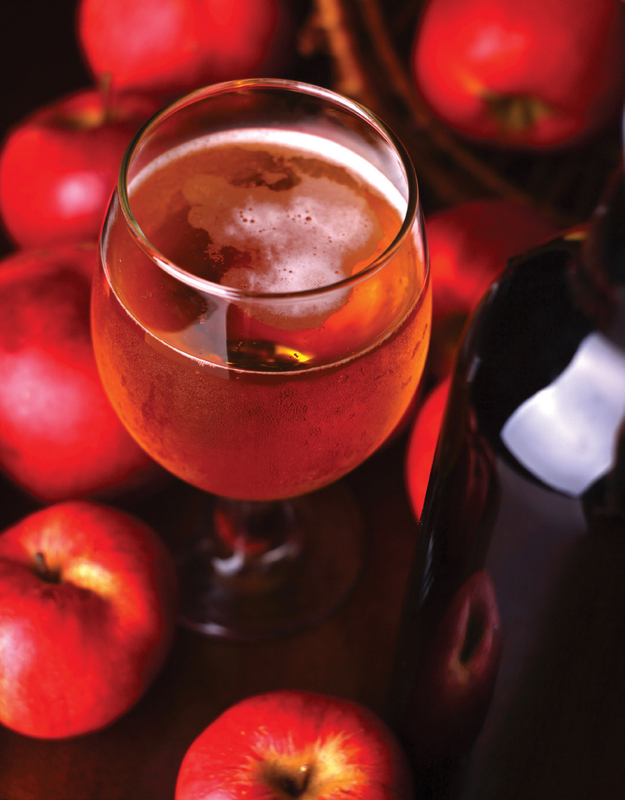 Ciders can be dry, off-dry, semi sweet, or sweet like a dessert wine or port. It all depends on how it’s made and, more importantly, the apple. Our Commonwealth has a long and storied love affair with the apple, beginning in the 1600s, when English colonists began importing apple seeds and seedlings from England. Apples were one of the earliest crops grown by settlers, and it wasn’t long before hard cider became a staple of the colonial diet. These days, Virginia cider circles are well-acquainted with the oft-told tales of our country’s Founding Fathers’ love for the drink. Yes, George Washington secured his first political post by providing cider to voters; yes, John Adams supposedly had a tankard a day; yes, colonists preferred the drink to water. Diane Flynt, owner and cidermaker for Foggy Ridge Cider in Floyd, says that where cider is today is an interesting tale in its own right. “The more uncommon story is that, before industrial farming, there were many varieties of fruits and vegetables, eaten and grown for different reasons,” she says, and apples were among the crops cultivated for specialized uses. “Apples for drying, apples for apple sauce, apples in June and apples in November—not just the five in the grocery store.” Flynt says that, in the same way that no one expects to make a good wine from a supermarket grape, the same holds true for cider. Making a quality artisanal cider depends on selecting the right fruit, which is more of a challenge than it seems. While there were once thousands of apple varieties, many have been lost to time and the demands of commercialization. Hard cider’s prominence on the American table began to slowly decline in the 1800s due to various factors, including the Temperance movement, urbanization, the rise of beer with a wave of German immigration, and then, during Prohibition, many cider orchards were destroyed. So today’s cidermakers face the prospect of working to find enough fruit and to cultivate heirlooms from the past. 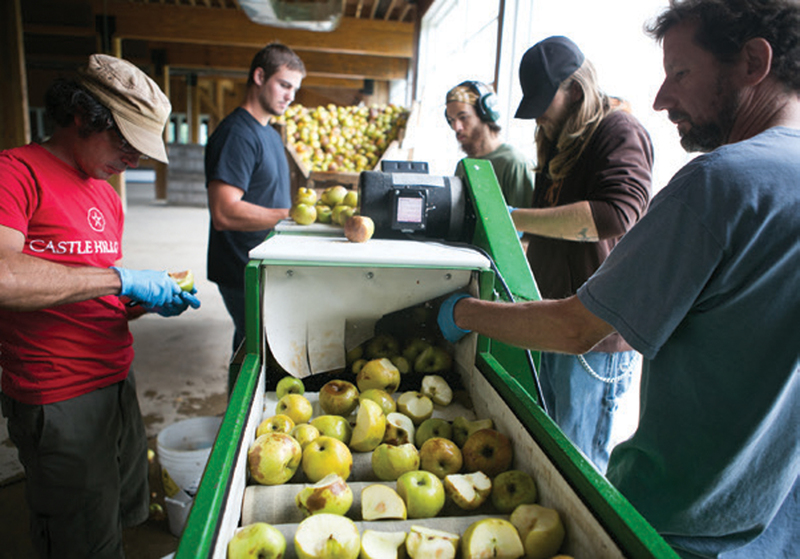 There’s an adventurous, innovative feeling afoot in many orchards and cideries. Geoff Robinson, director of sales and marketing (and former cellarmaster) of historic Castle Hill Cider in Keswick, says, “We have 26 varieties in an experimental orchard, and we see what grows, what we like.” Charlotte Shelton, owner of Albemarle CiderWorks in North Garden, is also CEO of Vintage Virginia Apples, a specialty orchard with over 250 varieties of apples, both new and old. Some, like Roxbury Russett, Albemarle Pippin, and Thomas Jefferson favorite, Hewe’s Virginia Crab, have survived since colonial times, while others, such as Gold Rush, were developed in recent years. Shelton says that, like wine grapes, apples are “terroir conscious,” meaning that they are influenced by the soil and climate in which they are grown. What grows well for cidermakers in Central Virginia can be quite different from the apple trees which produce the desired results for Flynt, whose orchard stands at 3,000 feet in the Blue Ridge mountains. According to Shelton, “The English shire varieties have not done as well for us, so we are more interested in American varieties,” whereas Flynt says at her elevation she has been able to grow high-tannin apples of both English and American origin. As Robinson puts it, “We look for the finest expression of the apple that we can get.” Thus, each cidermaker tends to have favored apples that work best for what they’re trying to accomplish. What they all have in common, however, is an understanding of what makes a good cider apple. It’s not generally the same as what makes a good eating apple. Two key components of an American cider apple are tannin and acid, which give the drink body and brightness. Often, a variety of apples are blended in hard cider to provide additional components, such as tart, sweet, spicy, and aromatic notes. However, like wine, ciders can also be made from a single apple varietal. In addition to their blends, Albemarle CiderWorks offers single varietal ciders from apples such as Winesap, Albemarle Pippin, and Hewe’s Virginia Crab, the latter their first reserve cider, which quickly sold out. Castle Hill offers two 100 percent Albemarle Pippin hard ciders; one, a sparkling cider named Levity, is aged in an 8,000-year-old technique using clay storage vessels/jars. While Flynt prefers blending her acclaimed ciders, which have been lauded in The New York Times and Wine Enthusiast, she also produces a dessert wine from Newtown Pippin (another name for Albemarle Pippin) and apple brandy, called Pippin Gold. Flynt says that hard cider is very food-friendly, and is as diverse as wine or beer. For pairing food with dry cider, such as her Serious Cider, Flynt says, “Think fat—creamy goat cheese, French fries, crab cakes, and pork chops pan seared in butter and bacon.” Off-dry ciders such as Foggy Ridge’s First Fruit are versatile and work with a range of flavors, including grilled foods and vegetables, quinoa, and a variety of cheeses, including pimento cheese, since an off-dry cider will still have enough acidity to balance out the fat. 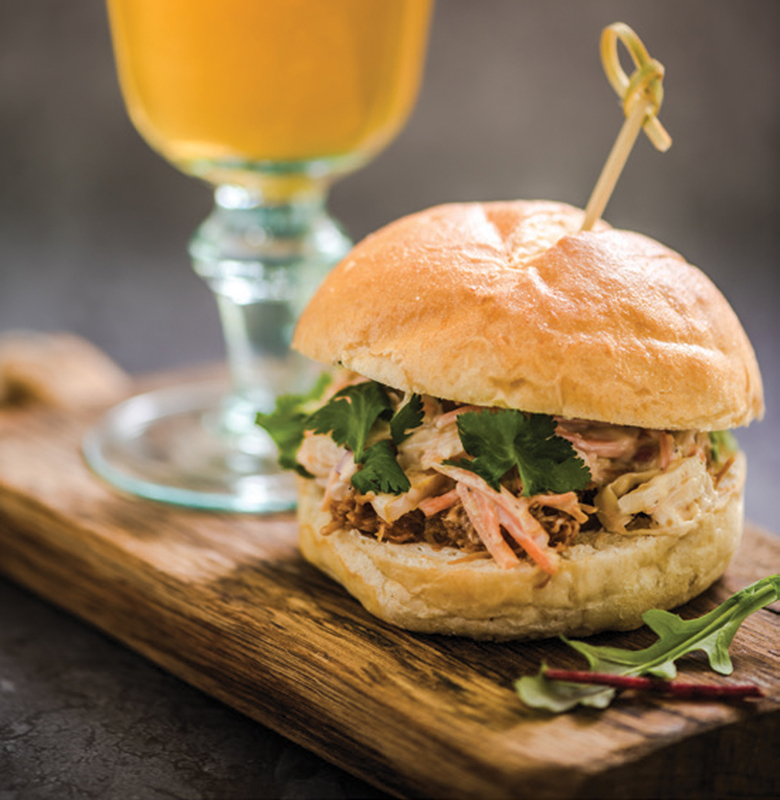 Fruitier ciders, such as her Stayman Winesap Cider, which she likens in sweetness to a drier Riesling, are a terrific complement to spicy foods, such as Thai, Indian, chili, and pulled pork barbeque with a spicy vinegar sauce. Flynt notes that, unlike wine, cider can handle being paired with sour, pickled flavors. Foggy Ridge regularly hosts a Chef Series, where chefs from noted area restaurants pair three tapas with three hard ciders. Castle Hill Cider hosts seasonal full dinners at the cidery, showcasing local chefs and restaurants with inventive food and cider pairings. Robinson is also a big fan of hard cider with pork, and likes paring Castle Hill’s dry ciders, such as Levity and Terrestrial, with shellfish and seafood. Serendipity, their best-selling cider, is made from 100 percent Albemarle Pippin, and retains just enough sweetness to make it an excellent choice for lighter fare, such as picnic foods and cheese boards. Robinson, a former restaurant owner and professional chef, enjoys cooking with hard cider as well. “Any time you think of a light white wine in cooking, you can substitute a dry cider,” he says. He likes to replace white wine with a dry cider in a classic beurre blanc sauce, which he serves with cod or white fish with capers and lemon. A sweeter cider can be used in place of honey or brown sugar in dishes such as braised cabbage or glazed carrots, and to deglaze a pan when creating sauces. It’s fun to get creative with cider—try using it instead of beer in a shrimp boil, and in place of wine or beer in cheese fondue, for a subtle boost of flavor. Foggy Ridge Cider, Albemarle CiderWorks, and Castle Hill Cider, along with many other regional cideries, are open for tastings and a variety of events throughout the year. Though Virginia Cider Week is officially in November, right now is a wonderful time to visit a cidery and orchard, and see what’s new with an old-fashioned favorite. If you can’t make the trip, you can always enjoy a crisp autumn evening on the porch with a zesty cider from your local store, paired with a plate of cheese and cured meats. Hard cider is a tasty seasonal alternative to beer at your next football party, and you can even make cider-based cocktails. For a nod across the pond, try a British “Snakebite,” made from equal parts cider and lager, but beware—rumor has it that some British pubs won’t serve it, because it goes down too easy!